In Tutorial 1 we will use the Siting Manager to Site Green Roof LID Types for later Optimization and Export to the InfoSWMM LID Usage DB Table. Tutorial 1 is designed for first-time users of InfoSWMM Sustain and provides a guided tour to core commands and functions used to create and execute a Siting and Optimization run in InfoSWMM Sustain. As such, it should be used as a launching point to a more comprehensive understanding of the program. This tutorial assumes you have already added your GIS data to the example model of InfoSWMM Sustain. The folder will have the Arc Map MXD file, the DB folder and the GIS Data needed for Tutorial 1. Use the LID Usage Table exported from Sustain in your InfoSWMM model. You add one LID Type and define the Siting Criteria one LID Type at a time. The InfoSWMM Message Board Window will show creation notes and whether there were any errors in the creation of the Green Roofs. The Siting Manager will find Green Roofs for the whole watershed but we will only use the LID Types on a Subcatchment. 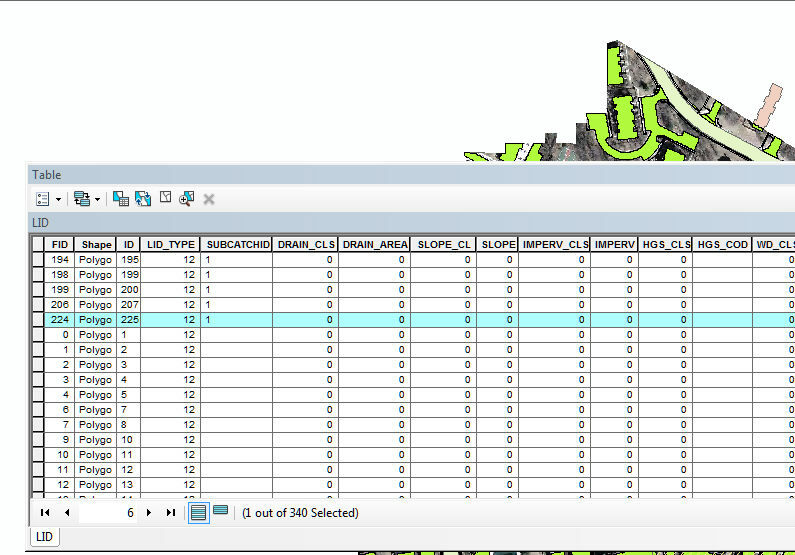 Use the LID Optimizer tool (1) to import all of the LID’s with a Subcatchment (2). All of the possible Green Roofs on Subcatchments 1, 2 and 3 are now found. You have to decide the actual LID Control for each LID Type. It is possible to have more than one LID Control (from the Operations Tab of the InfoSWMM Browser) for all of the Green Roofs. Click on the LID Control Box and Select a LID Control. Use the BlockEdit Tool or Icon to set the LID Control for all of the other Rows with an LID Type of Green Roof. We will use the preset targets of 89 percent for Runoff and Water Quality for all of the Subcatchments. The parameters are for type of Optimization Technique, the Cost Improvement Threshold, the Maximum Number of Iterations per Model Run, the Maximum InfoSWMM Model runs and the Number of Best Solutions to be Found during the Optimization Process. An important rule is that the total area treated by all LID Types for a particular Subcatchment does not exceed 100 percent of the impervious area. Use the BlockEdit tool again and set the Percent Imperviousness Area Treated to 5 percent per LID Type. The Number LID Candidates should be two now and the ID’s should be 173 for Subcatchment 2 and ID 199 for Subcatchment 1. 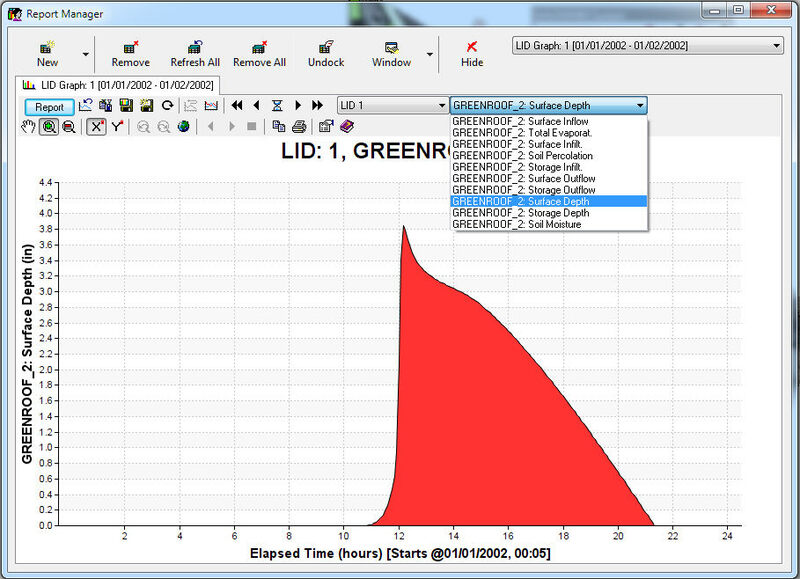 The Optimizer runs many InfoSWMM runs to optimize the selected LID Types. Click on Run and you will see a Blue progress bar at the bottom of the screen and at the end of the Run an Info Dialog Message Box. STEP 15: Click on the Design Report to See the Optimized Solutions. The Optimized solution for each of the found Best Solutions are shown in the Report Grid. STEP 16: Click on the Performance Report to see if the Control Targets were Met during the Run. The Control targets of 89 percent for Runoff and Water quality were met in this Optimization Run. The Cost Effectiveness Curve shows the Recommended Solutions (Green), Best Solution (red) and all of the Solutions (grey). Click on the Report Tab of the Cost Effectiveness Curve to see the Runoff Reduction and Performance for all of the Recommended Solutions. Decide on which solution to Apply to InfoSWMM. The Graph Icon report will help you decide. 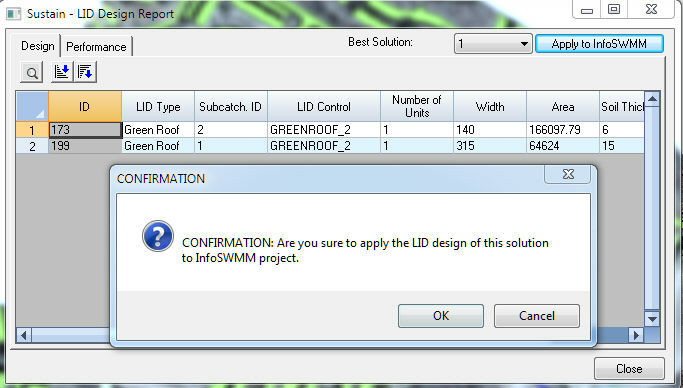 If the InfoSWMM LID Usage Table has been updated then your will get a Confirmation Message Dialog Box. You will see the LID Controls that were applied from InfoSWMM Sustain to InfoSWMM. These LID’s will be used in the InfoSWMM Simulation. STEP 22: Click on the LID Controls under Hydrology in the InfoSWMM Attribute Browser. 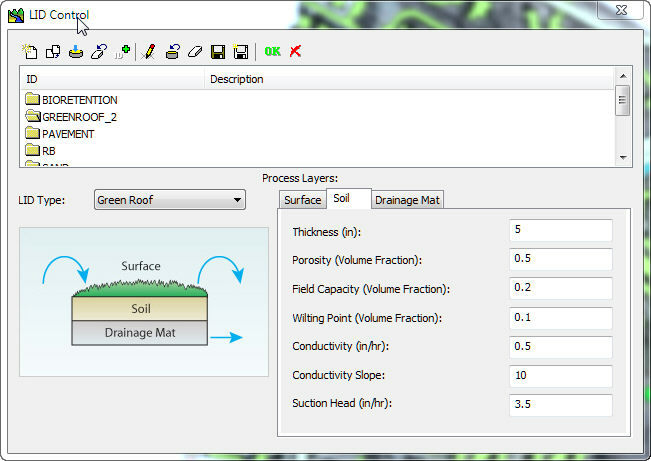 The optimized Green Roof parameters will be shown for each Process Layer. The LID results can be seen graphically, in the LID Report and in the LID Summary Report. 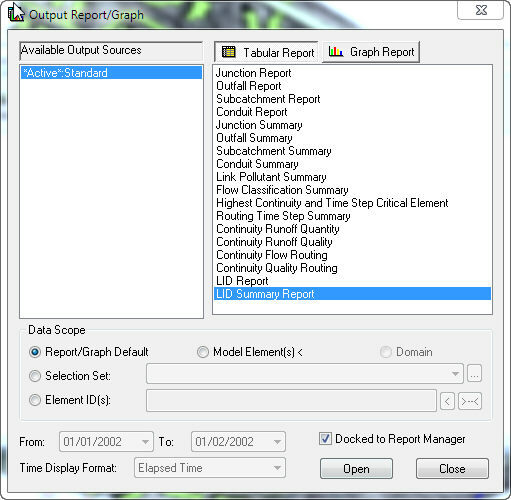 This summary table can also be seen in the HTML LID Report of InfoSWMM. You can see up to 10 Process Graphs for LID’s in InfoSWMM. This ends the short tutorial for optimizing Green Roofs in InfoSWMM Sustain. The remaining Tutorials will expand on this view of InfoSWMM Sustain.